Shouting comedian Dane Cook once said that every man's dream was to take part in a heist and for once he might have been correct. Diving into a dangerous situation and blazing out with tons of cash taps into our childlike machismo and it's hardly surprising that the "heist" scenario has been a staple of Hollywood for decades. We've had videogames that dabbled in the idea, naturally. Grand Theft Auto: Vice City and Kane & Lynch: Dead Men are two games that featured very memorable bank jobs, but few games are built entirely around high stakes robbery. As opportunistic as any burglar, PAYDAY: The Heist saw that gap in the market, bundled it swiftly into a swag bag, and may very well make out like a bandit. 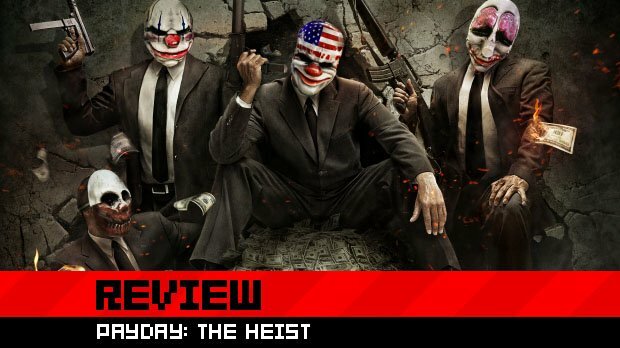 PAYDAY: The Heist has been described as Left 4 Dead crossed with the opening of The Dark Knight, and that's the kind of hyperbole to get any geek's blood pumping. Thematically, there are similarities to both of these things, as PAYDAY liberally copies the four-player co-op sensibilities of Valve's zombie shooter and transplants them into a game about robbers wearing clown masks. The game's six scenarios involve four criminals -- Dallas, Hoxton, Chains and Wolf -- partaking in different heists with their own unique environments, goals and rewards. The first and most popular scenario is First World Bank, an archetypal bank robbery in which players must shake down the manager to get his key, retrieve a drill, bore through a security gate, and then use thermite to burn a hole in the floor above a cash-laden vault, making sure to erase the building's security footage along the way. 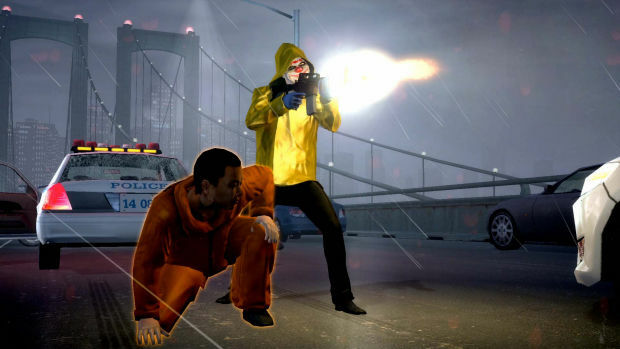 Other scenarios involve chasing down a fellow robber who betrayed the crew, rescuing a convict from a prison truck and even a more stealth-based mission in which the team must shut down security boxes and make off with diamonds. No matter the goal, every stage will have some running themes and teamwork will always be the crucial element of success. Players start out with a silenced pistol and assault rifle along with cable ties to take hostages. 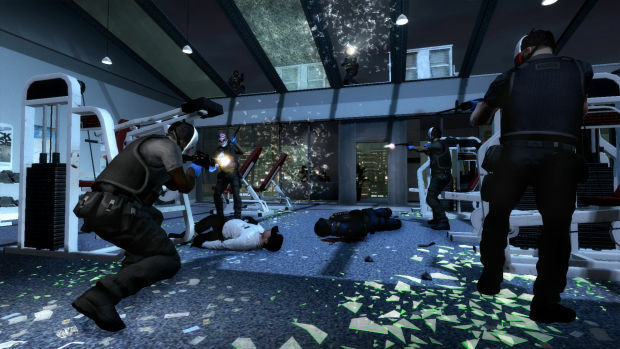 Hostages are an important asset in any heist as they can be used to trade with the cops for players who get taken out during combat. Killing civilians will increase the amount of time it takes for inactive players to respawn, so players must be careful with their shots and constantly shout at pedestrians in order to keep them on the ground and out of fire. Shouting at hostages, calling out to other players, and activating objectives is all done contextually with one button/key. Simply looking at an object and hitting the command will have the character act accordingly, be it helping up a downed colleague, placing a drill, or even demanding a security guard drop his gun, get on the ground, and cuff himself -- which never stops feeling awesome. Naturally, the long arm of the law doesn't take the crew's transgressions lying down. At regular intervals, players must defend themselves against "assaults." These assaults send waves of increasingly powerful law enforcers into the hostile zone and they can be incredibly difficult. 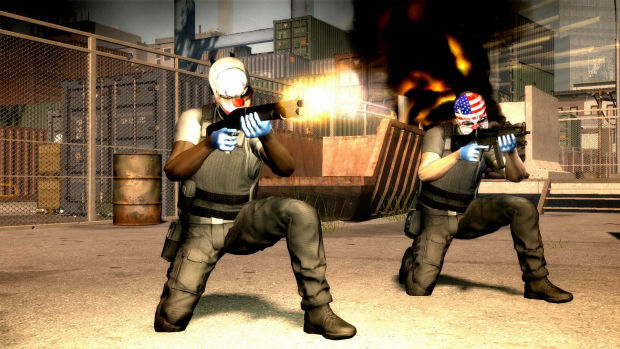 Regular cops and SWAT team members are bad enough, but there are a number of special units that can prove highly lethal, ranging from the infuriating tazer unit who can stun players indefinitely to the terrifying Bulldozer with his high-impact shotgun and full body armor. Players can "mark" these special units to make them easier to spot, but if they become isolated with any of them, chances are good they'll be on the ground in seconds. PAYDAY is an incredibly absorbing game if you get into a session with good team players. It's definitely hard, though, and sometimes feels pretty imbalanced. For starters, assault waves seem to have random difficulty spikes, with some of them feeling pretty easy and others becoming completely overwhelming. These spikes occur at different points when the level is replayed, meaning there's definitely a random element that's making the game extra tough. Some of the more mobile maps, where the crew needs to get from one area to another, also have some nasty choke points, where assaults can create roadblocks so thick with cops that the next assault wave can be ready before the last one is even mopped up. It often feels like luck is just as much a part of the experience as skill, and it can certainly cause consternation -- especially when you get sprayed with bullets and can't even see where they're coming from. Another issue I have is with ammunition, which runs out far too quickly. Perhaps it's to encourage the use of ammunition bags that players can carry and spawn, but it gets incredibly annoying to run out of bullets so fast. The problem is intensified by the fact that enemies drop ammo in such small quantities that it might as well be considered inconsequential. Things can get quite glitchy, too. PAYDAY is a rough game and, while many of the bugs are minor, I've encountered instances of important mission objectives not updating as needed. During the bank heist, the drill kept resetting its timer whenever it counted down to zero, and this continued even with multiple mission restarts. It didn't fix until the whole session was terminated. On the PC, there is also some nasty screen tearing at moments, and no in-game option to mend it. That said, PC is definitely the preferred system for the game. I've played PAYDAY on both PS3 and PC and found that the game's stiff aiming and methodical pacing works best on computers than consoles. It's still enjoyable on PS3, but I think the computer atmosphere is far more suitable. Despite the issues with balance and the technical flaws evident, PAYDAY's engrossing gameplay shines through. 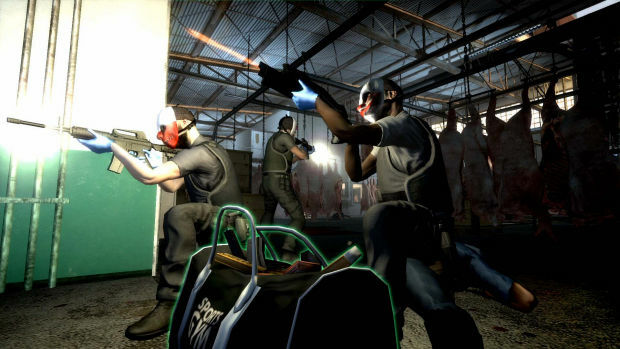 It's taken the very best of Left 4 Dead and added a lot more depth to the gameplay, going so far as to add a ranking system that unlocks new weapons and perks and special equipment like ammo and health bags that the whole team can use whenever they're in a fix. With some really clever levels and the consistently gratifying premise thrown in, you've got a game that holds up surprisingly well in the face of some pretty big faults. 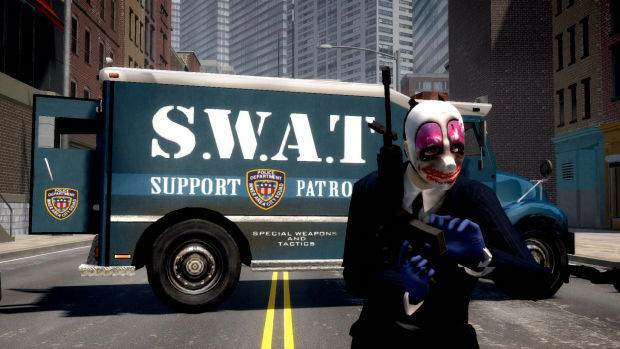 Graphically, The Heist is a very "basic" looking game. It's not exactly hideous, but animations are stiff and textures are flat, making it look very much like the low budget offering it is. Characters will occasionally freeze or clip through objects but the saving grace is that nine out of ten visual glitches are quite entertaining in their own right. Surprisingly, the voice acting is very good (helped by the fact that Hoxton sounds like Mick from the Magic Bullet commercial) and there's some suitably sleazy music to keep things atmospheric. I've played the two versions of PAYDAY across a number of hours and haven't even succeeded in a large number of heists, but that hasn't stopped me having a real laugh with it. PAYDAY: The Heist is a classic example of a diamond in the rough, a game that is just too enjoyable at its core for any of its issues to remain unforgivable. 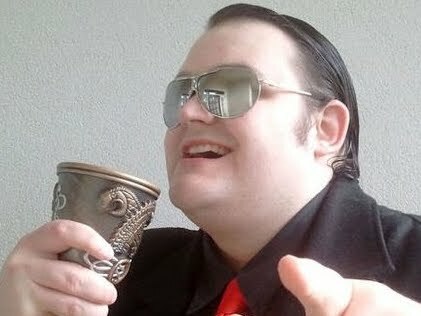 I have a feeling that, with continued support, it will only get better and better, and I think that shooter fans looking for something both different and perversely empowering will get a real kick out of what PAYDAY: The Heist has to offer. It has most definitely stolen itself a victory.